The Cuba Libre recipe is an easy and popular mixed drink that you'll find very familiar. Translated from Spanish, the name means “Free Cuba,” a phrase that was popularized around the end of the Spanish-American War and used to celebrate that Cuba was freed from Spanish rule. 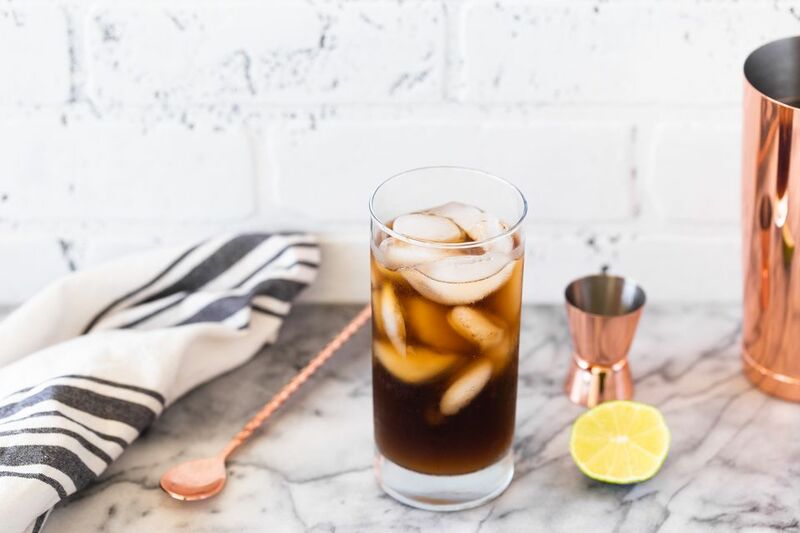 This simple mixed drink is similar to a rum and Coke, but the addition of fresh lime juice lightens up the mix and cuts through the sweetness of the cola. The lime is the single element that defines the Cuba Libre as a separate drink and it should be fresh (not from a bottle) to keep the drink authentic. Squeeze the juice of half a lime into a collins glass or highball glass. Add ice cubes and pour the rum into the glass. Fill with cola and stir well. If you want to make a more complex drink, after squeezing the lime, drop it into the serving glass and muddle it to release the citrus oil from the rind. Remove the fruit before adding the other ingredients. A collins glass is taller and narrower than a highball glass, so it would maintain the carbonation of the cola longer. However, you can make a Cuba Libre at home in any tall glass you have handy. If you can source some Mexican Coca-Cola that is sweetened with cane sugar, it will be more authentic than the American Coca-Cola sweetened with high-fructose corn syrup (HFCS). You can use other brands of cola or artisanal colas as you prefer. Light rum is usually chosen for the Cuba Libre, and to be traditional you should use a Cuban-style rum. However, if you like dark rum, you can give that a try in your cocktail. While the origins of the Cuba Libre and the rum and Coke claim to come from the end of the Spanish-American War in 1898, that is doubtful. Coca-Cola didn't arrive in Cuba until 1900. If there was a Cuba Libre before 1900, it was made with rum, water, and brown sugar. A Bacardi advertising executive claims he was in Havana in 1900 when the drink was first mixed with Bacardi Rum and Coca-Cola. A competing story is that the Cuba Libre was first mixed at La Florida restaurant in Havana in 1902 on the anniversary of Cuban independence. Iced drinks had been popular in Cuba since the 1800s. Although Cuba didn't make its own ice in those days, they had plenty of ice because it was imported by ice entrepreneur Frederic Tudor to the Caribbean islands in the early 1800s. The popularity of rum and Coke spread to the U.S. and during Prohibition, Coca-Cola was useful in hiding the flavor of low-quality booze. When the U.S. placed an embargo on Coca-Cola imports to Cuba in 1960, Cubans began making Cuba Libres with TuKola instead. How Strong Is a Cuba Libre? The Cuba Libre is a rather mild mixed drink. Its actual alcohol content will vary depending on the strength of your rum and the amount of cola you end up pouring. On average, though, it will mix up to just 11 percent ABV (22 proof). It's perfectly normal for highball drinks and about as strong as a glass of wine.